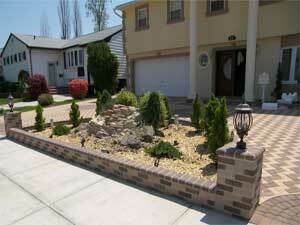 ACE Landscaping Services Inc. is pleased to offer masonry and paving services. 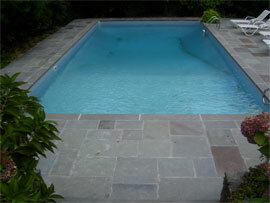 Ace offers a full range of masonry and paving services to compliment and enhance your landscape. Whether you are in need of a bluestone patio or a cement driveway, we bring years of masonry and paving experience to each project. Walkways, stoops, brick work, paving stones, flower boxes, and landscape renovation are all possible with Ace. We are not only proficient in the construction of these hardscape features but we bring a distinctive flare to each project. There is no need to take a cookie cutter approach to a wall or path when each site offers the chance to be inventive and creative with a solution. Ace customizes all of its masonry and paving projects so that each job is the best suited for each home and landscape. Imagine sitting on a raised, circular patio supported by natural stones and taking in a sunset on a warm summer's evening. If your property is lacking that certain element that would unify the landscape - you may be in need of quality hardscaping to enhance your outdoor living space. Call us today to discuss your masonry or paving needs, we'll be happy to be of service. Masonry work can lay the foundation for excellence in the home landscape. It adds structure, distinction and direction to the plan. Allow us to install your hardscape elements with confidence and craftsmanship. For our masonry needs, ACE insists on using Cambridge Pavingstones with Armortec for a driveway, patio, pool, walkway, sunroom or any paving project and Nicolock for retaining walls and paving stones. Both names are synonymous with quality concrete products.All of our masonry and paving contractors are lisenced and deliver only the best in masonry and paving services.For more information on Ace's Masonry and Paving division call us today.